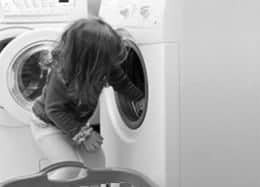 Highly concentrated “single-load liquid laundry packets” can cause serious harm to young children. Poison centers receive many calls each year about children getting into laundry detergent packets. Swallowing it often causes mild stomach upset, if there are any symptoms at all, but poison center experts have noted the highly concentrated single-load liquid laundry detergent packets seem to be different. Some children who have gotten the product in their mouths have had excessive vomiting, wheezing and gasping. Some get very sleepy. Some have had breathing problems serious enough to need a ventilator to help them breathe. There have also been reports of corneal abrasions (scratches to the eyes) when the detergent gets into a child’s eyes. Call the Poison Help line at 1-800-222-1222 immediately if you suspect a child has come in contact with this detergent. In 2015, the Missouri Poison Center received reports of 321 exposures to laundry detergents packets/pods in children or adolescents.